Are you ready for the Summertime Collection release from Clear and Simple Stamps tomorrow? It's going to be a fun one! How about a sneak peak of the Tennis Darling set that will release tomorrow. . .
How cute is she? 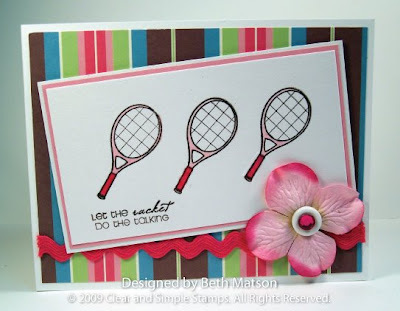 Or how about this adorable little racket stamp? 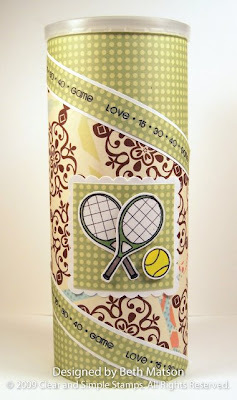 You can even decorate your tennis ball can. Be sure to check out the Clear and Simple Stamps blog along with the other design team members for more sneak peaks of the sets to be released tomorrow (July 15th). Links to all of the design team members blogs are available on the right sidebar. To make the faux brads I used a hole punch and punched out three dots of the My Mind's Eye paper then sponged the edges with Riding Hood Red ink. I mounted them to my card with pop dots and then applied a coat of Glossy accents to them to make them look more like brads. 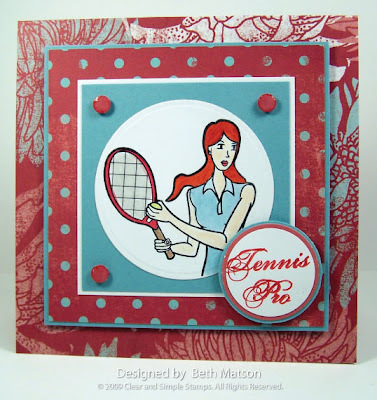 Love the tennis darling and how you colored her!! Fabulous projects, Beth! I really like the colors and layout on the tennis racket card. Awesome projects. I love the tennis ball can. Great idea! !